As a pragmatic, shrewd, and dangerous Bounty Hunter, you have a unofficial, galaxy-wide license to hunt and even, if you like, kill. The quarry and the reward is up to your contractor, but all the rest, from how you catch that quarry to what you do with it, is up to you. There aren’t that many rules that you adhere to, but there are many sentients throughout the galaxy that fear you. 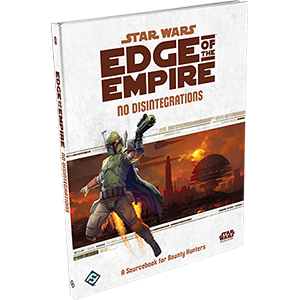 No Disintegrations, a sourcebook for the Star Wars®: Edge of the Empire™ roleplaying game gives you the tools and talents necessary to succeed as a Bounty Hunter, as well as the adventure material that Game Masters need to make that hunt thrilling, suspenseful, and a good challenge. Within its ninety-six full color pages you’ll find new species, three Bounty Hunter specializations and two Signature Abilities, plenty of iconic vehicles, sophisticated gear, and much more. No Disintegrations Is Available Now!